The USD share of FX reserves has steadily come down from 72% in 2000 to 62% now, though the USD is still the dominant reserve currency. Cumulatively, the USD share has fallen by 3.7% since the end of 2016 and by 1.0% in 2018 (despite supportive Dollar price action). Both the Fed and the Treasury Borrowing Advisory Committee (or TBAC) are increasingly worried about the future status of the reserve currency. 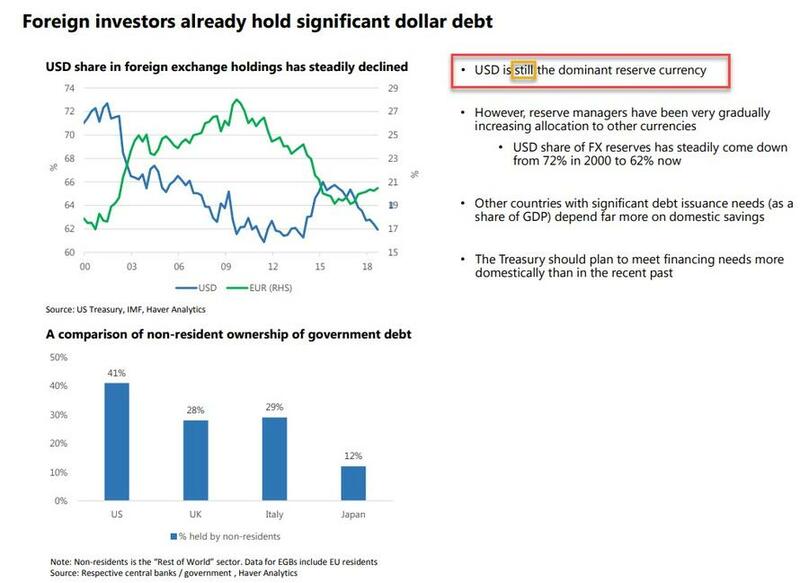 SOURCE: 03-30-19 - - "De-Dollarization Accelerates: Central Banks Dump Dollar In Q4, Buy Yuan"